AdEdge APU Systems for Arsenic Reduction or Co-occurrence of Arsenic Iron & Manganese, and Uranium Reduction. The Adedge solution for Water Treatment Systems is specially designed for the removal of arsenic and other metals from drinking water in applications that service a population of fewer than 10,000 users. Ideal applications include small utilities, subdivisions, schools, mobile home parks, restaurants, and many other small community and non-community drinking water systems. The Adedge Arsenic Package Unit (APU) is a commercially available system designed for arsenic removal for both water treatment systems and wellhead applications. Adedge APU products are standard skid mounted systems engineered for arsenic removal in the flow range of 5 gpm to 300 gpm. The central component for arsenic removal is AdEdge Bayoxide® E33 iron based adsorption media. Bayoxide® E33 has a high capacity for arsenic and unlike other iron-based media, is delivered in a dry crystalline form. Bayoxide® E33 has NSF 61 approval for drinking water and is available in large quantities to meet the ongoing needs of users. 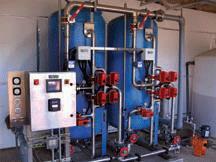 For co-occurence of arsenc iron & manganese these systems feature Adedge AD26 oxidation/filtration media. For uranium reduction, AdEdge features AD92 filtration media. New U.S. EPA regulations for arsenic removal have placed an unprecedented challenge upon small public water systems to cost-effectively meet safe drinking water compliance objectives. Many small systems such as schools, day care centers, very small community water systems, and manufacturing facilities need options that are simple, affordable, and effective. Additionally, solutions are needed that require less engineering, space, and infrastructure. Adedge Water Technologies’ answer to this market need is a new line of MODULAR arsenic treatment systems designed specifically for these applications. As the leader in providing cost effective arsenic treatment solutions in the market, Adedge Water Technologies, LLC., has successfully deployed numerous systems in the field accumulating an unparalleled track record of performance. Similar to Adedge’s skid mounted Adsorption Package Units (APUs), these compact modular systems utilize AdEdge Bayoxide® E33 granular ferric oxide adsorption media for arsenic or our NSF 61 certified Adedge AD26 oxidation/filtration media for iron & manganese to achieve the reliable high performance. Systems are shipped ready for field assembly and installation by a qualified contractor or installer. Modular systems are available in a variety of flow rates and configurations to meet needs from 10 to120 gallons per minute.